Derek Fine joined Rich & Cartmill, Inc. in 2016 as a commercial insurance and bond agent. 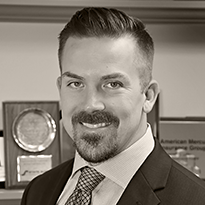 Derek has been in the insurance and finance industry since 2013 and began his insurance career at Federated Insurance. His prior insurance experience included specialization in the construction and manufacturing industry. Derek graduated from The University of Kansas in 2007 while being a second year captain of the 2008 Orange Bowl Champion, Jayhawks. After the Orange Bowl, Derek was drafted by the Buffalo bills in the 4th round of the NFL Draft. He spent 3 years in the NFL at Buffalo and Houston and retired in 2011. Derek enjoys spending time with his wife, Lindsey, and their children, Phoenix and Luna in his spare time.